Gladiators were divided into different classes according to their weapons and fighting styles. There were strict rules and protocol surrounding the fights of gladiators. A gladiatorial fight would usually involve two gladiators but gladiators such as the Venatores, only hunted animals. The Venatores fought in Venationes, or hunting shows, which were shown in a variety of different formats. Herds of wild animals were let loose into the arena and were slaughtered by the Venatores who specialised in archery and with the use of the spear. Emperors who wanted to demonstrate their hunting prowess and safely participate in the shows would join in this type of hunt. The venatores would hunt on foot or on horseback. The Venatores were trained at a special gladiator training school called the Ludus Matutinus. Ludus Matutinus means 'morning school' in Latin and was so called as the beast shows (Venationes) were scheduled as morning events at the Roman Colosseum. The Ludus Matutinus, or 'morning school', was established by the Emperor Domitian who was himself a great hunter. What type of gladiator was a Venatores? What weapons and armor did they use? What was their style of combat? 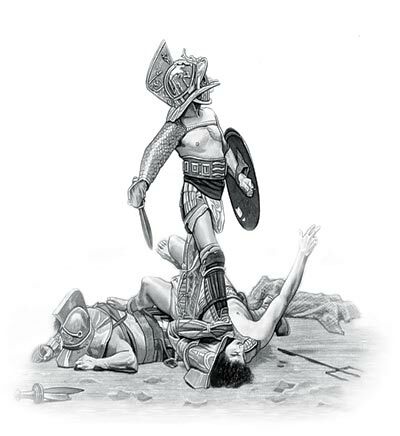 The content of this Venatores category on the different types of gladiator who fought to the death in the gladiatorial combats staged in Ancient Rome provides free educational details, facts and information for reference and research for schools, colleges and homework. Refer to the Colosseum Sitemap for a comprehensive search on interesting different categories containing the history, facts and information about Ancient Rome. Interesting facts and information on this type of gladiator: their weapons, their armor and their style of combat.